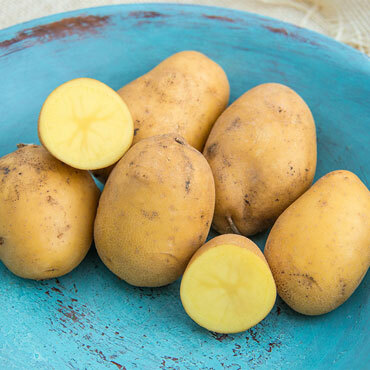 Regarded by potato lovers as one of the most delicious varieties available, Carola has the taste and texture of delicate new potatoes even after months of storage in dry, dark places. With a golden-tan skin and creamy yellow flesh, it's an ideal potato for all culinary uses (in particular, scalloped potatoes layered with cheese, cream, and chives). Each Carola crop provides abundant yields, so be sure to take your Gathering Apron when you go to harvest them. In addition, these potatoes are disease and Scab resistant. Note that they need plentiful, constant moisture during the growing season. 80-100 days to maturity. Sun/Shade: Full sun (at least 6 hours of direct sun). Spacing: 12-15 inches apart in rows 30-36 inches apart. Foliage: Medium green color with a medium texture. Fruit: Oblong to round tubers with smooth yellowskin. Soil Preference: Prefers well-drained, light, deep, loose soil, high in organic matter. Perform best in acid soil with pH 4.8 - 5.5. Needs plentiful, consistent moisture during the growing season.